2. Almost dying in the on-deck circle. A shard from Bill Russell’s broken bat hit him in the neck, puncturing his esophagus. (You know you’re an injury pioneer when your esophagus gets involved.) To protect Yeager’s beleaguered body part the Dodgers trainer created the first throat protector, which soon became part of every catcher’s protective armor. I’m pretty sure Yeager never wore the throat protector in the on-deck circle, which casts an odd light on the invention. It’s kind of like getting hit by a car and then inventing something that protects you from getting hit by trains. 4. Converting to Judaism. You could make the case that Steve Yeager deserves the starting spot on the all-time Jewish baseball player all-star team. There haven’t been that many nice Jewish boys willing to don the tools of ignorance. There was the colorful, defensively apt but offensively inept Moe Berg, early 1960s Dodger backup Norm Sherry, and current longtime weak-hitting, good fielding catcher Brad Ausmus. Mike Lieberthal is often also mentioned in discussions of Jewish ballplayers, but he seems to be pretty vehement about not wanting to be identified as a Jew. (I believe that, like me, Lieberthal’s father was Jewish. I proudly consider myself a half-breed, embracing neither Lieberthal’s apparent denial of his roots on his father’s side nor the orthodox Jewish belief that if a person’s mother isn’t Jewish that person is not at all Jewish.) I’d say all things considered Yeager tops all those guys, so if you’re willing to overlook the fact that he wasn’t actually Jewish while he was playing and instead concentrate on his willful post-career embrace of Judaism, he gets the starting nod, catching Sandy Koufax and taking his place in the following batting order: Benny Kauff (CF), Rod Carew (2B) (I follow Jonah Keri in including Carew), Hank Greenberg (1B), Sid Gordon (LF), Al Rosen (3B), Sean Shawn Green (RF), Yeager (C), Buddy Myer (SS), and Koufax (P). 5. Being one in a long line of good, if not excellent, Dodgers catchers. A couple days ago, hard on the heels of Manny Ramirez’s 500th home run, Batter’s Box wondered if Red Sox left fielders comprise the single best position of any franchise in baseball history, mentioning Ramirez, Duffy Lewis, Ted Williams, Carl Yastrzemski, Jim Rice, and Mike Greenwell. The ensuing conversation there and on the Baseball Think Factory turned up several contenders for the honor, including among many others Yankees centerfielders and first basemen, Cardinals first basemen, Browns/Orioles shortstops, and Giants first basemen. The first thought that came to my mind when I saw the topic was Yankees catchers. I wasn’t the only one to think of this. But no one mentioned the same position for the Dodgers. But consider all the Dodgers catchers named by Bill James as among the 100 best of all time (their ranking follows their names): Roy Campanella (3), Mike Piazza (5) (when the rating came out it was based almost entirely on his time with the Dodgers), Johnny Roseboro (27), Mike Scioscia (36), Steve Yeager (78), Joe Ferguson (79) (the journeyman had a few career-representative seasons with the team in question), and Mickey Owen (88). The Yankees’ list is probably a bit stronger–Yogi Berra (1), Bill Dickey (7), Thurman Munson (14), Elston Howard (15), Wally Schang (20) (see note for Ferguson), and Butch Wynegar (65) (see note for Ferguson)–especially considering that Jorge Posada deserves to be added somewhere pretty near the top, but the Dodgers’ backstops, current star Russell Martin included, are certainly no slouches. You could do a lot worse than a future Jew-embracing thespian willing to injure his esophagus and bare his petunia. 1. Continuing my line of thought in point 4: Keri names two catchers on his list of the 18 greatest Jewish ballpalyers (see link above): Ausmus and Harry Danning. Yeager has a higher “HOF Moniter” ranking than Danning. Ausmus has a higher ranking than Yeager, but would you really rather take Ausmus over Yeager, who along with being one of the two or three best defensive catchers of his time had some home run pop in his bat (unlike Ausmus)? 2. I was only paying attention during the last couple of seasons of Yeager’s career, but I would have thought he was a better hitter than he actually was. He does have a higher OPS+ than Ausmus, but Yeager only had 816 career hits, and he only hit over .230 in two of his last 12 seasons. 3. Yeager never hit well, but he hit a couple of memorable home runs (a grand slam against the Reds in the 1974 pennant race and a home run off of Ron Guidry in 1981) and that pretty much guaranteed him lifetime enshrinement in the Dodgers pantheon. 4. And there he is, enshrined as a Cardboard God, my all-time favorite baseball player. My favorite for my of the reasons you mentioned, though I must admit I had no idea he was a Member of the Tribe. Presumably he cited similar reasons for his conversion as did Sammy Davis (“cause its a swingin religion, man”). I only wish you had shown the 1977 Yeager card that pictured him in his crouch. This card was the only Dodger in the first pack of cards I ever got, and the real reason he’s my all-time favorite. To go along with 2 , yeah, he was barely competent as a hitter, though he did have his moments, notably the homer off of Guidry in the 1981 Series (going back to back with Pedro Guerrero for the Dodgers only runs). He was famous for his hitting motto, “Swing hard in case you hit something.” But, he was purported to be the best defensive catcher, and certainly the best throwing catcher, the Dodgers have ever had. That’s saying something in a group with Mike Scioscia and Russell Martin. His other bizarre injuries (apart from the bat shard) were getting plowed by Dave Parker in a home plate collision. Scioscia is equally famous for getting bowled over by Jack Clark a decade or so later. He was also knocked unconscious when an opposing hitter’s follow-through struck him in the head. That was the first time I saw my favorite player in person. In the top of the first inning, sprawled out behind home plate and motionless. Apart from the Playgirl appearance, Yeager was every bit the embodiment of LA in the 70s. He had that wavy, possibly permed hair, and he wore those glasses that turned into sunglasses outdoors. The one bummer about Yeager – he was roommates and best friends with insufferable boyscout and incompetent announcer Rick Monday. Oh well, we needed both of them (along with third musketeer Jerry Reuss) to win the title in 81. 5. 2 : For what it’s worth, Ausmus has been more apt to hit into a DP than Yeager was. He even led the league in DPs in ’02. 4 : I have a card of Yeager crouching, and now I wish I’d used it. Some other time, for sure. A very weird thing about Yeager in my collection: as I’ve mentioned before, for mysterious reasons my number of Dodgers, Braves, and Phillies have been seriously depleted from when I was a kid. 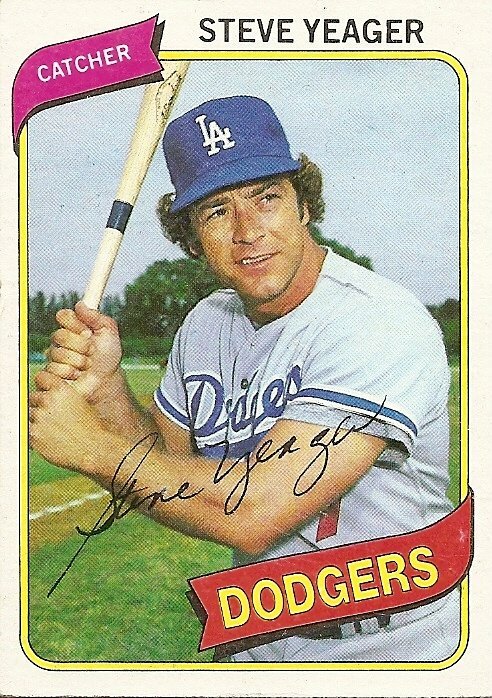 Yet I have five Steve Yeager cards, including the one shown here. That’s equal to as many cards as I have of any single player, I believe. So, to recap, very few Dodgers, a ton of Steve Yeagers. It’s as if whatever mysterious force robbed me of most of my Dodgers decided to let me hold onto Yeager in all his evocative guises (tinted glasses, crouching, sideburns, etc.). 6. I’m not suggesting he replace the great Greenberg on your all-Jew team, but surely as a Sox supporter there’s at least a place for Kevin Youkilis as the team’s DH, no? And how about that Ryan Braun? I know he’s only a second year player, but the kid is a beast. 7. 6 : Both very worthy candidates, but for the time being, since they are both pretty early in their careers, they probably have to get in line behind the very first DH (designated hebrew), Ron Blomberg. A couple more years like the ones they’ve been having and I can see both of them finding a way into the lineup, especially Braun. And Carew’s iffy eligibility (he married a Jewish woman and raised his children Jewish–plus as illustrated in the Sandler song his name rhymes nicely with Jew and he was mentioned in a Beastie Boys song–but is not himself Jewish) opens the door for another up-and-comer, Ian Kinsler. 8. I wish I could remember where I’d heard the story, it might have been in Bill James’ Historical Baseball Abstract. But on the subject of his Playgirl spread, once Yeager was hit with a foul tip in a sensitive area, and Jerry Reuss quipped, “What’s wrong? Did it hit you in the staples?”. Challenge accepted – let’s see what happens. Maybe not a bizarre accident, but baseball-related, was Yeager’s life threatening car accident on the way home from a game last year. He’s recovered and able to show off more scars. Steve Yeager is seldom called out for his role with the famous stable Dodger infield of Cey, Russell, Lopes and Garvey. Even though he was their catcher pretty well their whole run together. In my mind, I usually think of that group as a five man expanded infield that played together. 13. Along with the throat protector, didn’t Yeager also have something to do with the catcher’s mitt with the blaze orange tape around the perimeter? I vaguely remember it being him, but it could have been another mid-70s catcher. Other people remember those, right? Its not just me? I was a catcher from age 7 through college–lucky for me the fat kid had to go on vacation in 1975–and I remember at the time trying to keep up with all those mid-70s catching innovations. 14. 12 Joe Ferguson was got a lot of playing time behind the plate during the 70s. I think that’s why Yeager is not typically associated with the core infield, as opposed to the position he played. 15. I can’t type at all today. I get very worked up on the subject of the Boomer. 16. Ever since that accident, I’ve wondered about the outcome of the others involved. I hope they are alright, too. Judging from some of the scrapes that Chuck got into, there must be some extra strand in the Yeager gene makeup that protects them in catastrophic accidents. 17. 16 : I had those same two thoughts. I wonder why the fate of the other driver wasn’t mentioned in the article linked to in 11 . As for the Yeagers’ ability to cheat death via bat shard, plummeting aircraft, car crash, and Dave Parker, I guess maybe there must be something to that whole “Right Stuff” thing. 18. Small correction. I’m sure you mean Shawn Green, not Sean Green. Leave it to you, Josh, to present me with something I knew (the Yeager-bat shard incident) from a completely new angle (the remedy would do nothing to prevent the incident in question). It’s as if Rip Hamilton came up with his face mask after being kicked in the groin. 20. 18 : Correction made. I used to see him on the 101 driving a ferrari during the 70’s. He used to come by for drinks at my friends steakhouse in Palmsprings when he worked for the Angels, and I was told that he was one of the good guys. I loved his defense and because of that I never appreciated how good Fergy was until he came back for his 2nd term with the Dodgers. This is one of those things that I wish I thought of. 23. Gotta love my Jews! Represent boys. I too embrace being half Jewish, even though my mom is not Jewish. I was sad when Shawn Green retired because we grew up in the same vicinity and I had followed him since he was in high school. He was a classy guy from what I have heard and seen. Loved that Moe Berg book “The Catcher Was A Spy.” I have a great Hank Greenberg documentary I can send you Josh if you ever want it. After the thoroughly depressing play of the Dodgers the last few weeks, it was uplifting to read something positive about them. You are right about the Dodgers producing fine catchers as their specialty, even down to Paul Lo Duca who was better than ok for a while. Great post! 24. I’m beyond honored and flattered to get cited at Cardboard Gods. Love your work, Josh. Had no idea Yeager converted, that’s tremendous. It’s an interesting debate on Yeager vs. Ausmus. Since it’s close on a performance level (Ausmus has also been a plus defender during his career, of course), we may have to use Jewish standards to break the tie. Ausmus fulfilled at least part of his parents’ dreams by obtaining a degree from an Ivy League school. However, he did not become a doctor, lawyer or accountant. Yeager didn’t go to an Ivy League school…but he did show that he really wanted it in going through the conversion process. We may need a Solomonic split here. Have to agree that I’d want Braun and Youkilis on the team, even if that means we have to use a DH or a bench, or whatever. I had Kinsler in my top 18 too, big fan, he’ll be among the all-time mensches by the time he hangs up his spikes and tefillin. The Life and Times of Hank Greenberg is one of my favorite movies, period, never mind favorite baseball movies. I’m actually looking at my giant poster of said movie, signed by the talented filmmaker Aviva Kempner and framed. Only movie poster I own. Definitely worth a high spot in the Netflix queue. 25. Among my favorite Jewish players – because he is, perhaps, the most incongruous – was Jose Bautista. 26. 23 , 24 : I third the Greenberg film recommendation. 24 : Thanks for checking in, Jonah. Always good to hear from the world’s most eloquent Expos fan. 27. Long time lurker but you pulled me in! Yeager was my manager this January at Dodger Adult Fantasy Camp in Vero Beach. It was the single greatest week of my life (sorry babe!). He was insanely competitive, incredibly funny, and just plain foul. He was salty like we were back when we were 12 years old and just learning how to really swear. The team loved him, we adopted his personality and generally taunted and annoyed the other campers long after we left the field…well until we lost the title game. I tore my hammy something bad early in the week but modified my swing (with his help) and used pinch runners so that I could stay in the line-up when Steve said he needed my bat. For the record, you just can’t imagine how your over-the-hill head swells when a former big leaguer says “can you go? We can use your stick in the in the line-up…” I was dizzy with delight before the words stopped vibrating the air. What I am trying to say is that I loved playing for Yeager and would run through a brick wall for him without thinking twice. 28. 27 : Thanks for sharing those memories, Joe. They made for a very enjoyable read. 29. My recollection of Yeager is a weak hitting catcher during the regular season, who came up big in the post season. I looked up his career post season numbers, and it was the World Series in particular where he excelled. In 4 WS he hit .298 with 4 HRs and 10 RBIs, plus 4 doubles. He only hit .198 in LCS, and .228 regular season in his career. 30. And Steve Yeager was a nice guy too. When I was a kid, my little brother and I approached him for his autograph before a game at Dodger Stadium. He was sitting on top of the dugout engaged in a conversation with two fans whom he obviously knew well. My mom had taught me to not interrupt adults when they are talking, so I was hesitant about asking for his autograph. But my desire for his autograph prevailed and so my little brother and I politely interrupted his conversation. He turned to us with a big genuine smile, said something along the lines of “sure, I’ll sign that for you”, and signed for both my little brother and I. 31. 27, that makes tearing your hamstring sound like a good time! 32. Anyone else remember Steve Yeager as a Seattle Mariner? I wouldn’t if I didn’t have the baseball card. 34. 33 : That was a fun article. Thanks for passing it along. 35. I’m an Armada season ticket holder, and I have to say that it’s been great to see Steve on the field. We recently took our 13 yr old allstar team to the field for an outing and our manager got to throw the 1st pitch to Steve. In June, The Armada made a road trip to Canada and became short-handed. Here is a blurb from the Armada website (www.longbeacharmada.com) about Yeager joining the active roster..
36. 35 : That’s awesome. Thanks for passing that along. I take it Yeager didn’t end up getting into a game? 1985, San Diego Padres hosting the Dodgers. My senior year, my best friend and I were huge Dodger fans and had great seats, right above the Dodger dugout. As they warmed up along the side there, about an hour or so before the game, I shouted out, “Hey Boomer, when ya gonna hit one out?” and after waiting a beat, Yeager replied, ” Whenever I play.” It was so funny because we saw Lasorda turn and look at us like we were obnoxious Padres fans!!! By then, Mike Scioscia was the regular catcher so I imagine Yeager still wanted more playing time. He would catch for Seattle a year later. (played in the Roger Clemons 20 k game).